Simple, fast and clear help for planing your day at a lake. 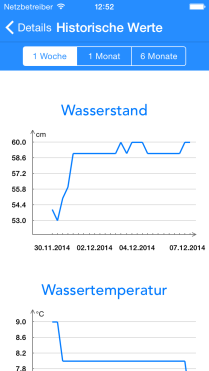 Be informed about water temperature and water level of lakes in Carinthia at first. Do you live in Carinthia or do you plan a vacation there? Do you want to get information about the local lakes and rainfall to plan your bathing day or vacation optimally? All information will be updated on every start of the app to keep you always up to date. These data is offered from the federal province of Carinthia. Comprehensive possibilities for notification. For instance, you can get notified if the water temperature of a lake or a rainfall exceeds or falls below a specific value. H2K – Das Kärntner Wasser-App participated in the OpenDataChallenge 2015, a competiton arranged by the Federal Province Carinthia to create innovative and creative applications and concepts. A requirement was the usage of Open Government Data. Experts rated all submissions in different categories. 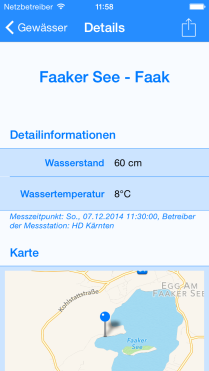 In the catgory “Web-based applications and mobile applications (Apps)” H2K – Das Kärntner Wasser-App achieved the first rank.